Set to shame the S3? The iPhone 5 was always going to be hotly anticipated, but now comes word it'll be streaks ahead of the competition. It'll put the Samsung Galaxy S3 "to shame" according to the CEO of Foxconn, the company that owns the plant building the next Apple handheld. Terry Gou sang the praises of the next iPhone at Foxconn's annual shareholder's meeting, according to Focus Taiwan. But then maybe Gou's comments should be taken with a pinch of salt. It's in his interest for the next iPhone to do well after all. And the report says he has made it a lifetime goal to defeat Samsung, a company he describes as having "a track record of snitching on its competitors." So he's not exactly impartial. Gou also spoke of Foxconn's relationship with Sharp. In March Foxconn became Sharp's single biggest shareholder, acquiring a 10 per cent stake in the Japanese company. Gou claimed Sharp's manufacturing facilities will give Foxconn a three-year lead on Samsung. Sharp is expected to make the screens for the forthcoming Apple TV set. Speaking of the deal with Sharp, Gou said: "I respect the Japanese and especially like their execution and communication styles. Unlike the Koreans, they will not hit you from behind." So he's not one to mince his words. 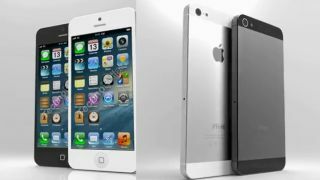 The iPhone 5 is expected to launch in October, with a larger 4-inch screen and new striped back panel.